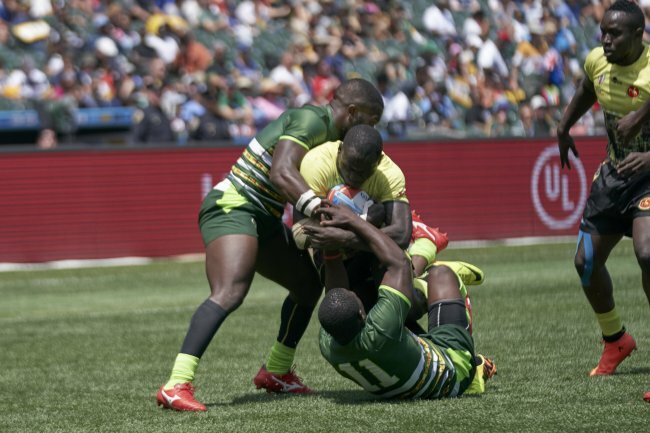 At the close of the 2018 Rugby World Cup Sevens tournament at the AT&T Park in San Francisco, Uganda are keen to finish on a high. They play Chile for only the second time this year after meeting in the World Rugby Sevens World Series qualifier in Hong Kong. Uganda set up a date with Chile after knocking out Zimbabwe 24-10 in the Bowl quarter finals. Tolbert Onyango, the Uganda coach explained that the 'derby' against Zimbabwe reflected how well Uganda can play. The resolve, after coming unstuck against Samoa in the opening match was to bravely battle it out for what was on offer, The Bowl. "After we were knocked out of contention for the main cup, we decided to use the experience to play in the next matches and Zimbabwe was first up," explained Onyango. The noticeable difference was in defense and physicality where Uganda matched the grit of their opponents. "Our defense held well and the structure was much more defined. We had more patience in the build up too," he offered. Although the physical contacts threatened to wear out the players, the coach assured there was no hiding from this technical part of the game because it set a base for attack. One of the players who has caught the eyes of Onyango is Byron Oketayot who has come back from injury much stronger. Together with the captain James Odongo, Uganda's play revolved around their ability to win the physical contacts. One area which the Ugandan coach has concerns is in discipline because of the number of yellow cards conceded. "It is a concern but we are working on it," he assured. The coach is confident his team is on the right path and their confidence is building up when playing on a bigger stage. In the match against Zimbabwe, Philip Wokorach scored the first try in the first minute and Aaron Oforyworth converted for a 7-0 lead. Solomon Okia added the second after two minutes to extend the lead 12-0. A captain's try by James Odongo closed the account in this half with Oforyworth adding the extras as Uganda led 19-0. Zimbabwe pulled one back through Shingirai Hlanguyo in the fourth minute. But, when Hlanguyo was yellow-carded, Uganda used the numerical advantage to score a try through Odongo. A late rally saw Shayne Makome score a try for Zimbabwe but Uganda were already home and dry. Kenya 19 Tonga 7, Canada 29 Papua New Guinea 21, France 50 Jamaica 0, Wales 33 Zimbabwe 12, Samoa 45 Uganda 7, Russia 21 Hong Kong 7, Japan 33 Uruguay 7, Ireland 17 Chile 12; Scotland 31 Kenya 26, Argentina 28 Canada 0, Australia 17 France 22, England 19 Samoa 15, New Zealand 29 Russia 5, Fiji 35 Japan 10, South Africa 45 Ireland 7, USA 35 Wales 0. Murunga: Kenya shall not be relegated.